Work with all aspects of batch processing in a modern Java environment using a selection of Spring frameworks. This book provides up-to-date examples using the latest configuration techniques based on Java configuration and Spring Boot. The Definitive Guide to Spring Batch takes you from the “Hello, World!” of batch processing to complex scenarios demonstrating cloud native techniques for developing batch applications to be run on modern platforms. Finally this book demonstrates how you can use areas of the Spring portfolio beyond just Spring Batch 4 to collaboratively develop mission-critical batch processes.You’ll see how a new class of use cases and platforms has evolved to have an impact on batch-processing. Data science and big data have become prominent in modern IT and the use of batch processing to orchestrate workloads has become commonplace. The Definitive Guide to Spring Batch covers how running finite tasks on cloud infrastructure in a standardized way has changed where batch applications are run. Additionally, you’ll discover how Spring Batch 4 takes advantage of Java 9, Spring Framework 5, and the new Spring Boot 2 micro-framework. After reading this book, you’ll be able to use Spring Boot to simplify the development of your own Spring projects, as well as take advantage of Spring Cloud Task and Spring Cloud Data Flow for added cloud native functionality.What You'll LearnDiscover what is new in Spring Batch 4 Carry out finite batch processing in the cloud using the Spring Batch projectUnderstand the newest configuration techniques based on Java configuration and Spring Boot using practical examplesMaster batch processing in complex scenarios including in the cloud Develop batch applications to be run on modern platforms Use areas of the Spring portfolio beyond Spring Batch to develop mission-critical batch processesWho This Book Is ForExperienced Java and Spring coders new to the Spring Batch platform. 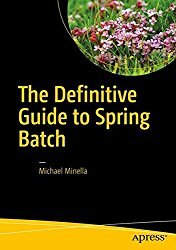 This definitive book will be useful in allowing even experienced Spring Batch users and developers to maximize the Spring Batch tool.